Earlier this year, Tripod Crest worked with Hanson on a £22million project in Dorset. The A338 forms a strategic transport link connecting Bournemouth to major trunk roads and the motorway network. It also provides the area’s 440,000 inhabitants with access to the mainline railway station and Bournemouth Airport. The A338 Bournemouth Spur Road forms a strategic transport link, connecting the South East Dorset conurbation – which has a population of around 440,000 people – to main trunk roads and the motorway network. It also provides access to the mainline railway station and Bournemouth Airport. The latter is already a significant industrial zone but it is expected to provide an additional 42,000m2 floor space and 1,200 new jobs over the next 10 years or so. The A338 is the busiest road in Dorset and carries approximately 59,000 vehicles a day, nearly 4% of which are HGVs. So there was a very strong case indeed for a major upgrade to remove the need for high volumes of expensive yet minor repairs like potholes, to reduce congestion and journey times, to improve safety, to reduce noise and also to boost inward investment and therefore local employment. The ultimate client for this £22million scheme was Dorset County Council (DCC); who funded the works through the Dorset Local Enterprise Partnership, under the banner of the Bournemouth International Growth Programme. The existing close working relationship between DCC and Hanson UK, through the Dorset Highways Strategic Partnership, led to a forward thinking approach from the very start that ensured the delivery of the A338 project on time and on budget. Specifically, the scheme required the full upgrade of the pavement and highway infrastructure covering a 9km section of the dual carriageway, and Tripod Crest was appointed to deliver an ‘end-to-end’ service for highways pavement solutions. Tripod Crest was chosen for its planing service and its planing equipment to meet challenging outputs, which supported Hanson and its project partners to fully reconstruct the 9km dual carriageway in just under nine months. Tripod Crest supported Hanson Contracting UK through the Early Contractor Involvement stage, a process that commenced in September 2014. Tripod Crest held planing trials prior to the commencement of the main works to establish and assess the efficiency of the operation, composition of the pavement material and the potential productivity levels. 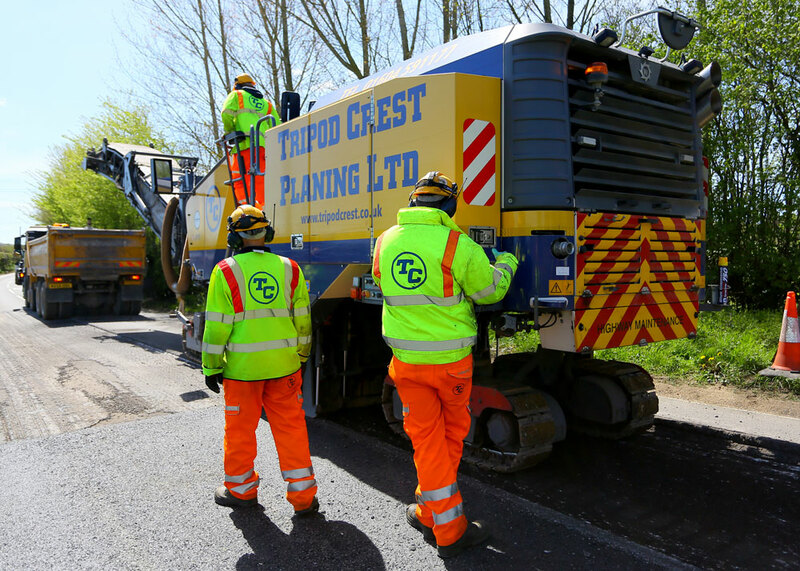 Tripod Crest’s area manager, Dave Smith, worked collaboratively with Ian Price, Hanson Contracting UK’s project manager to optimise how the planing operation efficiently sequenced into the civil engineering and resurfacing operations. This enabled Hanson to co-ordinate where the planing operations fed into the cyclical workflow that took place across four phases. The first and largest section commenced on the 6th September 2015 and was completed in time for the Christmas embargo period. Tripod Crest planed the pavement to a nominal depth of 235mm or 210mm for the main line inlay works. The planings were collected by Hanson to be recycled back into the new pavement as a Foamed Asphalt product. Tripod Crest operated 78 planing shifts; consistently averaging approximately 940 tonnes of planed arisings across each nine hour shift. The efficiency of operations and commitment to maintain a consistent team of expert planing resources also saw Tripod Crest exceed 1,250 tonnes planed on 14 different occasions. Planing performance peaked at 1,587 tonnes achieved in a single nine hour shift during Phase 4. This consistently high performance was achieved through selecting the right planing machines (Wirtgen W2100 and W210i) that possessed the power and reliability to deliver the levels of outputs stated above. Across the 78 planing shifts, the team experienced only one minor breakdown that resulted in three hours lost across the whole planing programme. Integrated delivery plan achieved through close working relationships with Hanson and the other civil engineering disciplines taking place prior to and following the planing operation; where circa 70,000 tonnes of planings were generated for recycling by Hanson. 24 hour round the clock working – there were 27 calendar days where Tripod Crest planed during both the day and nightshift. Enhanced performance – optimising the planing operation to maximise the productivity and provide Hanson Contracting UK with earlier access to the working areas for the next stage of the reconstruction process. This contract was finished on time and the road re-opened on 28th May 2016, delivering a bespoke, sustainable road surfacing solution that is providing long-term enhanced durability, less noise and more resistance to rutting and cracking. All of which has met with great acclaim from all stakeholders.